Disqus makes it easy for people to add color to content across 3 million websites around the world. And each day, millions of users contribute through comments, replies, upvotes and follows about thousands of topics and interests. Today, we’re announcing new features and changes to our notifications that make it easier for people to track their conversations and better engage with site content on an ongoing basis. Here’s a breakdown of what you’ll start seeing this week. Since everyone likes quick and easy, you can now reply to comments directly inline. Now you'll get notified when you receive an upvote from another person. No need to manually re-check a comment for interactions. You’ll now receive notifications of new followers and have the ability to follow back immediately. Need a reminder of why following is cool? To cut down on clutter, you are also able to easily filter notifications to view just replies by clicking the ‘Replies’ tab on the top navigation. You can find these new features by clicking on the notifications bubble at the top-right of any English language commenting embed while logged in. 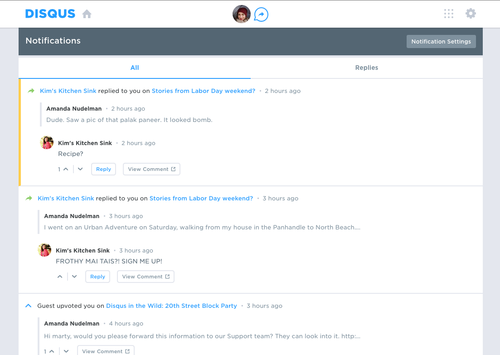 A new Disqus sidebar should be revealed on the right of your screen. To learn more about notifications, please visit our help page or come discuss it directly with us on Discuss Disqus. We’d love to hear your feedback.